No fruit screams “Summa Time! !” quite like watermelon – amiright? No BBQ in the summer months is complete without a juicy sweet watermelon to dig into. I personally love how it quenches thirst. Hydration is one thing I really struggle with and I constantly have to remind myself to drink enough so watermelon helps me get enough fluids in the summer heat. Watermelon’s attractive vibrant color makes it that much more enjoyable to eat. The color watermelon has is due to a phytonutrient from the carotenoid family known as lycopene (also found in tomatoes). Lycopene provides that deep red pigmentation. The deeper color your watermelon is the more lycopene content it has. Lycopene is a powerful antioxidant that is associated with decreased risk of cardiovascular disease, cancer, and inflammation. Watermelon is also a great source of vitamin C that is needed for your immune system and healthy skin. Tip: leave your watermelon out on the counter until you are ready to cut into it (store in the fridge only a few hours before you are ready to bite in). This will increase it’s lycopene content. And as if you need anymore convincing to eat watermelon… it is also rich in citrulline which is an amino acid that can help lower high blood pressure. Citrulline can also help reduce muscle soreness making watermelon a great post-workout snack for recovery after intense exercise. It’s simple sugars will also help replete energy stores after a work out. 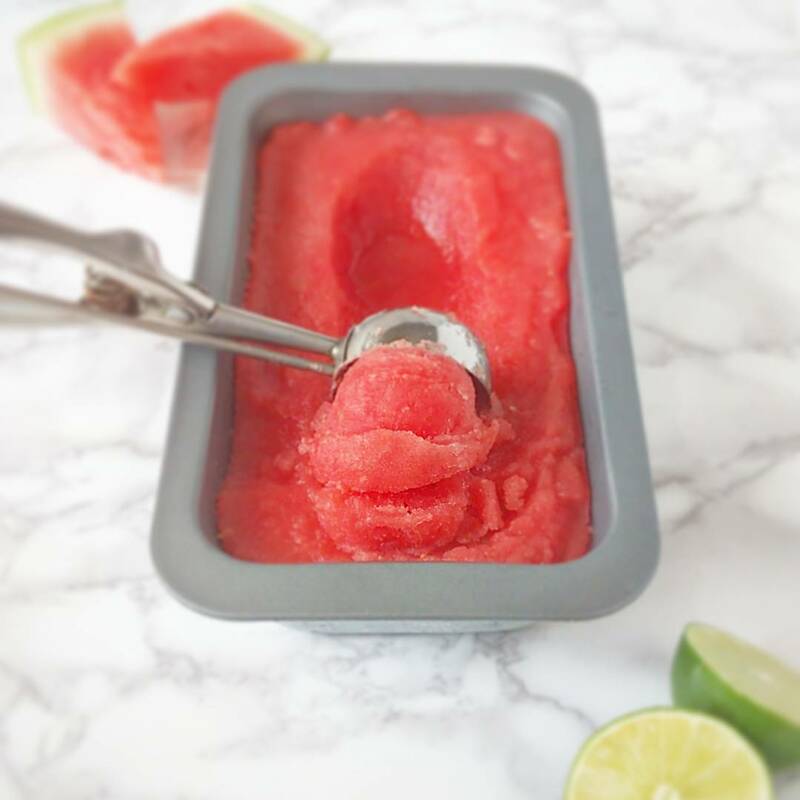 So now knowing how awesome watermelon is, I had a halft eaten watermelon sitting in my fridge and I knew I wanted to create a fun refreshing treat for you guys. I was brainstorming an idea with my sister, Shelly, who suggested watermelon sorbet. My response? YAS! I’ve provided you the results! 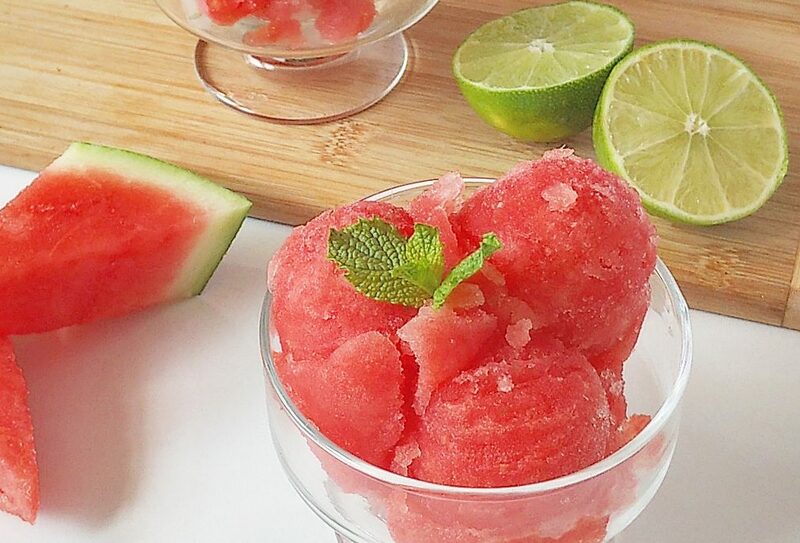 This is the perfect all-natural way to enjoy watermelon and chill out in the summer sun! Enjoy! Place watermelon, lime juice, and lime zest in a blender and blend until no more lumps from the watermelon are present. About 2-3 minutes. Pour liquid into ice cream maker and allow it to churn for 10-15 minutes. You may have to stop it in middle to break up some bigger pieces to make sure it stays a smooth consistency. Remove from ice cream maker and place in a small pan. Cover with saran wrap and freeze 2-3 hours. Feel free to swap lime for lemon if you prefer. If you freeze it overnight it will be a bit icy and hard to scoop. Allow it to thaw 10-15 minutes before scooping. You want it to be a bit of a slushy consistency but still firm enough to scoop into balls.